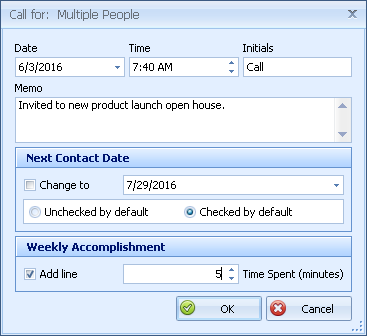 Creating an entry in the Contact Log (previously referred to as a Call Note) can be done from each of the lists (Customer, Address and Unit) as well as the List Builder. You can customize the note any way you like. For example, instead of putting your initials, you could put the word, Call in the Initials field. Click OK to accept and close the form. To view all entries made within a date range, see View Calls & Email Entries from the Contact Log.